nautical miles myself I was enamored with the kayak exhibit, particularly with the different designs of the coastal Native Americans. 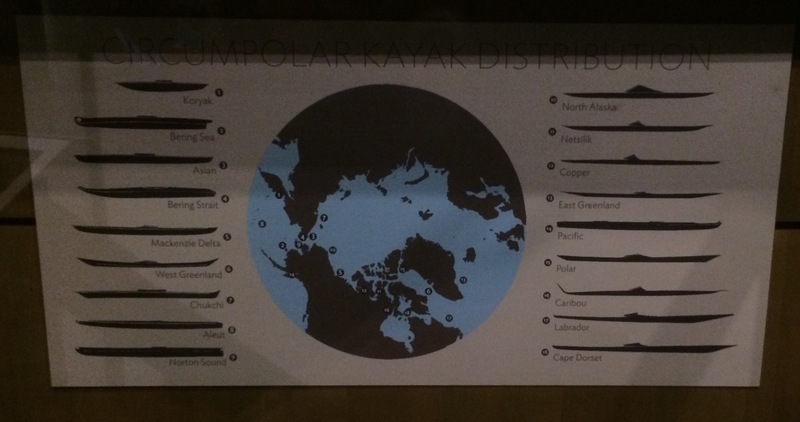 The above photo is circumpolar map of the many different designs of kayak for each specific location. 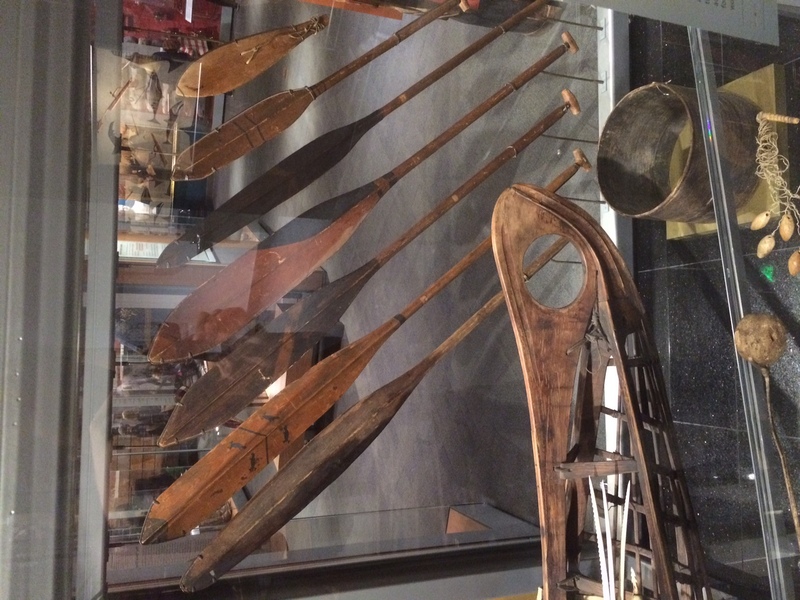 Different designs relate to the different tasks each kayak was used for. For instance the kayaks of the Norton Sound were longer, sleeker and had a faster hull design than most other Bering Sea Kayaks. The design of a fast kayak was necessary to hunt belugas in the Sound. 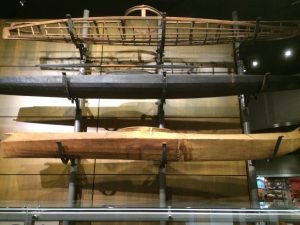 In comparison, the King Island kayaks of the Bering Sea were much slower yet some of the sturdiest crafts built by Native Alaskans. Kayak frames are engineered with intricately carved wood and wrapped tightly with waterproof seal skin. Walrus skin covered areas susceptible to more wear. These were lightweight, fast and able to be paddled in h igh winds and stormy seas. Skilled boat builders would supervise construction inside their ceremonial houses. 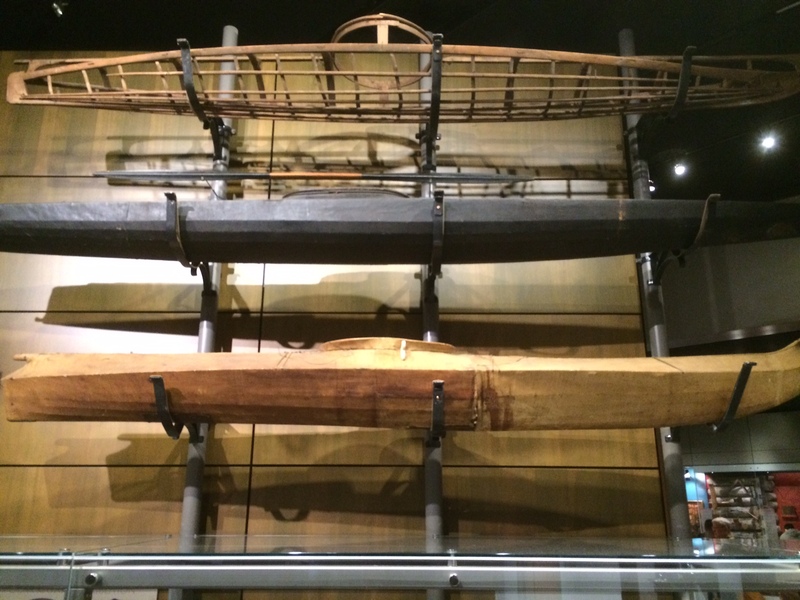 They used body measurements to ensure the kayak fit its intended user. After frame parts were lashed together women cut and stitched sealskins for the covering. They were built in the winter for use in spring time. Single bladed paddles were used for normal use and double bladed paddles were used for speed. Paddles were also used to right themselves in the water if they had flipped over.